As I was wandering through the airport this spring I succumbed to my one true addiction: books. Yes, I know that a good environmentalist uses the local library, but I’m working on it….. Anyway, as always, I try to pick up something that I’ve read a review on or something that just jumps out at me. And there is was, in all its blue/green authority, Ecoholic Home by Adria Vasil. “The greenest, cleanest and most energy-efficient information under one (Canadian) roof” was its cover’s claim. I could not resist. Settling into my most uncomfortable chair in the airport waiting room I started to glance through the book’s fresh pages, careful not to break the spine. I noted that it was efficiently organized into sections and sub-sections. It had graphics and text boxes and had the opposite appearance to an academic tome, so I started in. By the time they called me for my flight I was well past Cleaning and onto Cooking. As I tucked myself into my seat I came across some information that took my breath away and cemented my affection for this book. The Quick Tip for stainless steel cookware: “If you’re allergic to nickel, look for the nickel-free variety, since most stainless steel is cut with the stuff.” Holy smokes! Could this explain the eczema explosion my daughter experienced since training and working as a chef? Further research confirmed this, but that’s another story. We are quite often confronted with the notion that just one person can’t make a difference. Clearly Vasil does not subscribe to that thinking. She has clearly outlined hundreds of easy things that we can do or change that will add up to a lot. As Canadians we have to do more, we have the highest energy use of any citizen on the planet. She informs us that our households are responsible for 46% of our country’s emissions. Just as many drops fill a glass, the many small things that we can do will add up to a lot. Most of us are already changing light bulbs and using our cars less but there are hundreds of other small things that we can do. 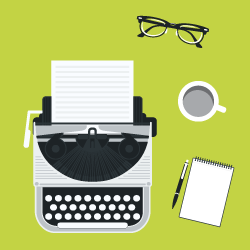 Vasil’s book is not just another list of what to do and not do. It is the most comprehensive reference on having a green, safe and money-saving home available today. It covers cleaning, energy, decorating, gardening and more. For folks with asthma or other lung issues the section called Breathing includes sensible advice on creating the type of breathing environment that is required for a long and healthy life. For starters, ditch all those ridiculous sprays and plug-ins. They are bad for the environment and bad for you. Decorating, a section required due to Canadians’ continued renovation craze, is most useful. Who knew that you could get FSC-certified Canadian maple and oak flooring? And recycling your old carpet? Yes, it’s true. She tells us how to do it. Low VOC paint? Almost all lines of paint are jumping on the bandwagon. One of the most important aspects of this wonderful book is her advice on “greenwashing.” In every section there are helpful warnings on what to watch out for. Just because it says green on the label doesn’t mean that it is a product that is safe, environmentally friendly or even useful. 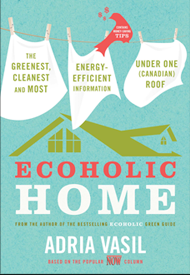 Although it is a bit late for this year’s spring cleaning, Ecoholic Home should be on your summer reading list. Funny, helpful, approachable, this book has it all.